The Kiratarjuniya is a sanskrit epic poem written by Bharavi in the 6th Century AD, describing the interaction between Arjuna and lord Shiva in the guise of a kirata or mountain-dwelling hunter. The poem is set during the period of forest exile of the Pandavas within the story Mahabharata. Facing the prospect of war against the Kauravas at the end of their exile, Arjuna is advised by the sage Vyasa to seek divine weapons. Reminded of the humiliation that his brothers and his wife Draupadi faced during the dice game where they lose their entire kingdom, Arjuna decides to perform an austere penance. Arjuna is guided by a yaksha to the Indrakila mountains near the present-day region of Vijaywada and prays to Shiva. Here, Arjuna endures the hardships of the weather and overcomes many temptations, standing steadfast in his goal. Pleased with his penance, Shiva decides to test his valor by appearing as a hunter, with both of them shooting a wild boar simultaneously and arguing over who shot first. Upon realizing that he is unable to win, Arjuna at last recognizes Shiva and surrenders to him. 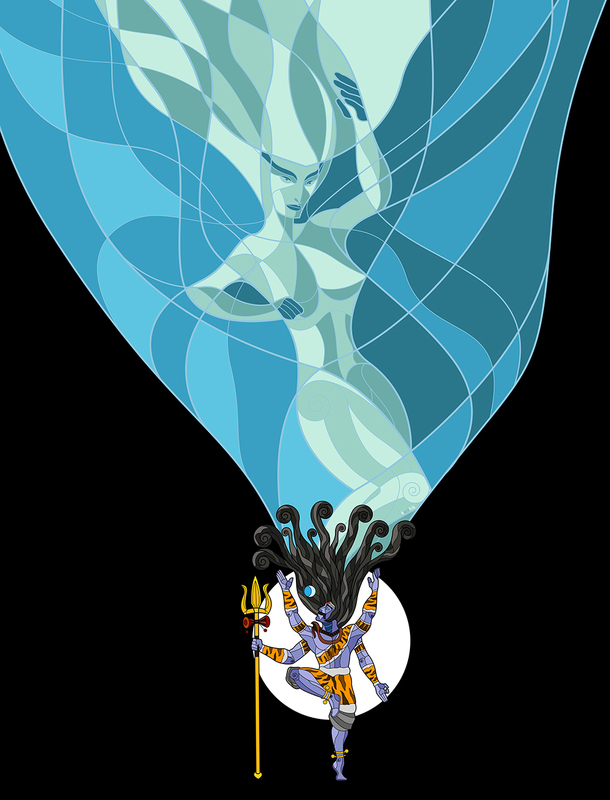 Shiva then grants him the powerful Pashupatastra, whose descriptions parallel that of a modern day thermo-nuclear weapon. I think of This episode from the Mahabharat as a transitionary period. Until this point in the story, the main characters of the story (the 5 Pandava brothers) have had a moderately comfortable upbringing, survived treachery via the burning wax palace courtesy of their cousins, had their new kingdom handed to them on a silver platter by their uncle the king, cultivated the land with the help of Krishna and Balarama, built a fabulous palace with the help of the architect Mayavi, lost the entire kingdom in a game of dice and been exiled for 13 years in the forest. They interactions have been only with other human characters so far and have only been accumulating either moral teachings or alliances with other kingdoms through marriage. This is the first divine encounter that they actively seek out that also manifests in the form of a tangible object they can make use of. (I’m not counting their meetings with Krishna since an Avatar is a bit of a complicated person who is sometimes considered either wholly divine, wholly mortal, a bit of both, or neither). Considering that Arjuna receives an enormously powerful weapon that he is immediately warned to never use due to its terrible effects, and the fact that the weapon is never mentioned again for the rest of the epic leads us to question the purpose of this episode. Is it to tell us that the Pandavas were righteous by divine ordnance? Or is it just a confidence boost for Arjuna to have an unusable powerful weapon in his quiver, just like he has Krishna on his chariot in the battlefield? Or is it to mirror the adventures of his brother Bhima meeting Hanuman or Yudhisthira meeting the crane who turns out to be a Yaksha who turns out to be his father Yamadharmaraja, the god of death and divine justice, which also serve as lessons in humility and wisdom? Perhaps all of these and perhaps none. When it came to drawing the piece, I made Shiva seem like a giant bestowing an enormous weapon capable of tearing apart the very fabric of the universe to the tiny insect-like Arjuna to show the parity in stature between them. And for the border’s border, I decided to put a composite statue of Nandi, which is the bull that serves as Shiva’s ride. 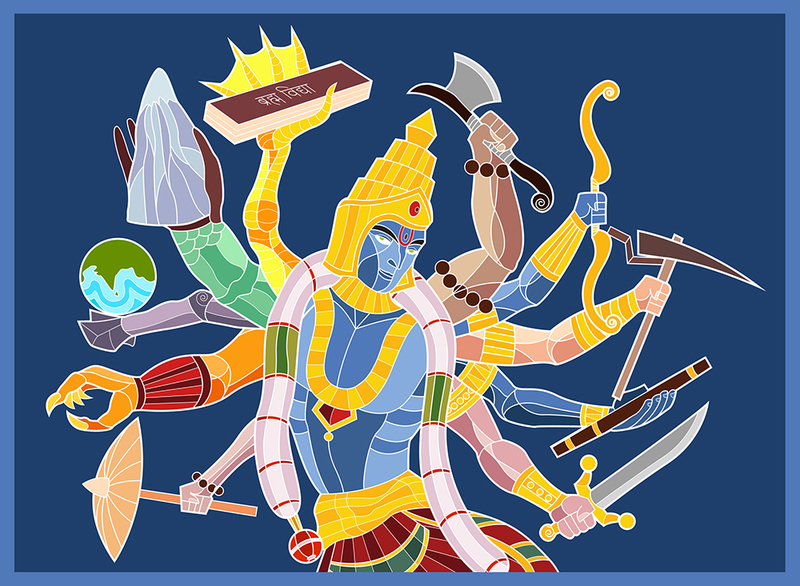 We all know the common story about the ten avatars that the Indian God Vishnu takes to protect the world, but more on that in just a minute. When I was making a drawing of Ravana, I wanted to originally draw him with ten hands playing the Veena. But ten hands for one instrument seemed excessive. So I thought I’d make each hand play a separate instrument, but that looked a bit awkward. Then I had a flash of an image with something related to each of the ten avatars of Vishnu in Ravana’s ten hands. While that made an interesting image, that made no sense at all. Why would Ravana of all people pay homage to Vishnu’s avatars? And then it hit me, I could just draw a ten-armed Vishnu with each arm paying homage to each of the ten avatars. And so I started off sketching the figure and the various arms, but then I hit upon another problem. Seven of the avatars were human or humanoid and could have arms, but the first three were animals. How was I supposed to have meaningful arms for these? This I sort of managed to address by giving them humanoid-like hands or just using their limbs as-is. Varaha-this one was a little challenging since this was essentially a wild boar whose hand isnt supposed to be articulate. The story has the wild boar carrying the earth to safety on its snout so I settled on the earth on its hoof. Kurma-this was even more challenging since a tortoise’s hand is even less articulate. In the story, the tortoise carries the mountain Mandhara on its mountain, so I settled on a tortoise arm carrying a mountain. Matsya-this was the most challenging, since fish have no hands and I didn’t want to make a tentacled cthulu-esqe monster. In the end I settled on a mer-man type arm to give the semblance of an aquatic creature carrying the vedas that were stolen by the demon Hayagriva from Brahma. Then came another dilemma - some count Balarama as one of the ten avatars and some count Buddha as one of the ten avatars. Which would I follow? In the end I decided upon Balarama because his plough-in-hand was a lot more interesting visually. In Bharatanatyam, Krishna is often shown in this common pose of standing with crossed legs and holding a flute. Usually the cows are grazing or gopis are dancing in the background, enjoying the divine music of his flute. It’s a fairly simple and very iconic image. His brother Balarama, holding a plough, is often associated with agriculture. According to the story, Balarama once called Yamuna to come to him, but when she refused, he hooked her hair with his plough and dragged her to where he was. I suppose this is metaphorical of revolutionary irrigation techniques involving damming or redirecting river waters for agriculture. Krishna is strongly associated with animal husbandry, where the cows were said to give more milk just by listening to his flute. Together, Krishna and Balarama form the duality of the agricultural revolution. They represent a shift from the Vedic beliefs, where the deities Indra and Varuna were worshipped for rain/water, to a state of self reliance and better harnessing the natural resources of land and water. It also represented a shift of mentality in working towards what you wanted instead of waiting for some divine sign or intervention. Stories within the Mahabharat tell us that when Krishna suggests that the villagers stop worshipping unseen forces like Indra to nurture the known forces of the surrounding environment, he was met with strong resistance to this shift of thought, evidenced by Indra thundering his anger upon the villagers via torrential rains and Krishna protecting the townsfolk under the Govardhana hill. This sort of “harness/develop your natural resources” attitude is evident once more when Krishna and Balarama help the Pandavas convert the dense forests/arid deserts of Khandavaprastha into the fertile cultivable/livable land of Indraprastha. Most animals choose to adapt to the environment they are placed in and either die out if the environment has drastic changes or are forced to re-adapt once again. Few animals come to mind that shape their own environment. One is the beaver, which is also MIT’s mascot, is considered to be the Engineer of the natural world owing to its ability to build dams and reshape its eco-system. Another is the termite, which builds giant mounds to help regulate temperature and water. So, what are the resources sitting unused around you? What are you going to do about them? How have you shaped your environment to better suit your needs? Isn’t that the true meaning of Engineering? During the exile of the Pandava brothers in the forest after their loss in the game of dice, Yudhishtira finds all of his brothers dead/with their spirits trapped next to a lake by a stork who owns the lake. They have been trapped as punishment for drinking water without the stork’s permission. The stork (which reveals itself to be a Yaksha, a subterranean dweller and hoarder of wealth), then proceeds to ask questions to Yudhishtira about the nature of life, the universe and everything in it (way before the Hitchhiker’s Guide to the Galaxy decided to tackle the subject). The story often puts Yudhishtira in moral dilemmas where he is often forced to choose between an option which will require him to bend/break the rules and help his family but will make him look bad vs. an option which will require him to follow the rules and hurt his entire family but would make him look good. As a result, we often find him sitting and analyzing the intricacies of what the morally right thing to do is, always fearful of doing something rash instead of taking necessary action. This incident appears to be the turning point for Yudhishtira where his brothers have been incapacitated and he has to logically come out of the problem on his own. And for the first time in the epic, when forced with a life or death situation, when pushed to act and make a decision, he is able to understand the meaning behind the sufferings his family undergoing, review the events of his life dispassionately, reflect on his duty, gain renewed drive and purpose and solve the problem on his own. Only in the end does the stork reveal itself to be Yudhishtira’s father Yamadharmaraja, the god of death and justice. This dialogue is called ‘Yaksha Prashna’ or the questions of the Yaksha. Here are the last three questions that really make you think. Q: What is the biggest wonder? A: Day after day countless people die, yet those who remain either believe themselves to be immortal or cannot accept death. What greater wonder can there be? Q: What is the correct path? A: Arguments can lead to no certain conclusion. The srutis are all different from one another. There is not even one Rishi whose opinion can be accepted by all. The truth about Dharma and Duty is hidden inside our hearts, therefore that alone is the path that the great have followed. Q: What is the eternal news? A: This world full of ignorance is like a pan. The sun is the fire, the days and nights are the fuel. The seasons are the wooden ladle. Time is the cook that is cooking all creatures with these aids. This is the eternal news. As a design, I chose to show this in contrasting colors of dark purple signifying night with the four brothers trapped as four orange flames, burning and crying out for help at the base of the tree where the stork resides, something that is especially apt considering the last question. The stork with it’s wings spread against the moon is very reminiscent of a Dracula-like figure who is both intelligent and dangerous. I considered making a drawing with the questions and answers in them, but realized that a lot of the answers are not simple riddles, they are very metaphorical in nature and translating them into appropriate imagery would be quite challenging! Learning about the various Bharatanatyam hand gestures, I saw a combination that represented Rama, with the left hand closed in a fist but with the thumb extended upwards and the right hand folded as if holding an arrow. I was inspired to draw ‘Rama in Exile’ as the character of Rama himself performing the bharatanatyam dance, depicting the hand/body gestures of himself. I added a bow, arrow and quiver to make it a little more descriptive. Since this is a time of Rama’s life when he’s not in the palace and he’s forced to live as a hermit in a forest, I’ve always found it hard to believe that he’d be neat and cleanly shaved. Hence I gave him matted hair and a beard to indicate that he has isolated himself from civilization and is living amidst the ascetics and wild animals. In this drawing he’s not shooting at anything in particular, but perhaps I’ll add something in, like the hunt for the golden deer or watching over the monkey kings Vaali and Sugreeva fighting for the throne of Kishkintha. During this sketch, I realized that I was drawing more characters from the Dashavatar (or the ten Avatars of Vishnu), I added the discus and conch shell over his shoulders to signify that it’s an Avatar or part of a potential series. This also made me think about Rama’s status within the epic of the Ramayana itself. Some parts indicate that everyone knew about his avatar status, such as when Vishwamitra takes him around to commit divine deeds such as the slaying of the Rakshasas that destroy hermitages or the liberation of Ahalya from her stone prison or the breaking of Shiva’s bow to marry Sita or Hanuman’s unconditional, undying devotion and love. Some parts indicate that Rama knew that he was an avatar such as when he invokes Varuna to cross the ocean and everyone is surprised to see him, or when he agrees to be exiled to the forest foreseeing a divine plan but everyone around him is deeply troubled by this decision. Some parts indicate that nobody knew about Rama’s avatar status, including Rama himself, because he feels pain, anguish and misery at Sita’s abduction and wanders the forest aimlessly while searching for her. Thinking about Rama’s status in the epic also makes us think about what we can learn from him. There is little we can learn from Rama the God, because Gods can do unbelievable things that no man can do and their story is more like a fantasy epic. There is much to learn from Rama the Man, because it shows us that even in the worst of circumstances, if one is clear about what one wants from life, then all problems can be conquered or outlasted. Lastly, it is very difficult to learn from Rama the Enlightened Man, because he seems to make choices that no normal man would ever dare to make and he always thinks about the good of the Realm, the family and legacy above his own personal good. This is a popular dance form from the Indian state of Kerala, with the main theme being love and devotion to the Indian deity Vishnu. Mohiniyattam literally means ‘The Dance of the Enchantress’. The character of Mohini is said to be an avatar of Vishnu, associated with two specific stories. Story1 - Vishnu appears in the form of the Enchantress Mohini to trick the demons out of their share of the Nectar of Immortality (Amrit) which they obtain by churning the Ocean of Milk. Story2 - Vishnu also takes the form of Mohini to save Shiva from a demon called Bhasmasura. Bhasmasura had procured a blessing from Shiva that anyone upon whose head he lay his hand would burn to ashes. Bhasmasura then decided to test this on Shiva himself, causing Shiva to run away in horror. Mohini intercepts them and challenges the demon to a dance contest with the prize being the chance to wed her. The demon follows Mohini’s every dance move until Mohini places her hand over her own head. The demon follows suit and places his hand atop his own head, burning him to ashes. When reading into the history and mythology of various Indian classical dances, I was quite fascinated by the stories behind this dance form and was inspired to draw it. For this drawing, I decided to place a Mohiniyattam dancer beside a demon with a fiery hand trying to mimic her every movement, ending with placing his hand atop his own head, leading to his own fiery demise. I considered adding Shiva hiding behind a tree somewhere in the background but it seemed to disturb the balance of the piece so I relegated it for another time. If folks like this, perhaps I’ll share more step-by-step images! Narasimha is a half-man and half-lion avatar taken by Vishnu to defeat the demon king Hiranyakashipu. The story goes that the demon king had been blessed with a boon that he couldn’t be killed by anything that was born, or any man or any animal, or by any instrument living or dead, in day or night, in the earth or in the sky, indoors or outdoors. The parameters of the demon king arise at twilight, when Narasimha emerges from a shattered pillar with a terrifying roar in this monstrous form. The creature which is neither man nor animal drags the demon king to the threshold of the house, places him on his lap and tears him apart with his claws. When going through dance poses from Bharatanatyam, I came across one that seemed to emulate the rage and fury of this avatar perfectly, while also combining the grace and beauty of the dance form itself. My first draft had more oranges and reds, but I wanted to find a subtler way of showing the mood. Hence I settled on an ashen tone for his skin with the violent reds and oranges in his clothes and mane. The story of the Kalyanasaugandhika from the Mahabharat is set during their 13 year exile in the forests. One day, a beautiful flower with an intoxicating smell wafts on the wind and falls near Draupadi. Fascinated by this flower (called the Kalyanasaugandhika), she asks Bhima to go in that direction and bring back more such flowers. During his travel, Bhima goes through a banana grove where he meets his elder brother Hanuman (the wind god is their common father) and learns a lesson in humility. Bhima then goes on to retrieve the flowers. When I learned that the Kalyanasaugandhikam was a very popularly depicted story in the Kathakali dance form in Kerala, I realized that this was an excellent opportunity to depict Hanuman himself as the Kathakali performer. The colors are relatively muted when compared with regular Kathakali costumes but they have a charm of their own. I also discovered that the face paint color in Kathakali is based on the character portrayed. Heroic characters use predominantly green in their facepaint (like Krishna or Arjuna). A green-red combination is used for a charming or mischievous characters. Completely red facepaint with a red beard is used for demons or very fierce characters. Hunters and woodsmen are depicted with predominantly black facepaint and a black beard. Women usually have yellow/golden facepaint. Characters who are noble but have an angry side to them like Shiva or Balarama or Bhima who are depicted with an orange facepaint. Characters with dangerous dispositions also have a knife design painted on their face, like a black knife for Yama or a red knife for Ravana. Variations occur for characters like Hanuman who is depicted with a white beard which represents very noble characters. Shiva and Parvati as the cosmic dancers, their rhythmic movements representing the motion of the entire universe, signifying the union of time, energy, space and consciousness. 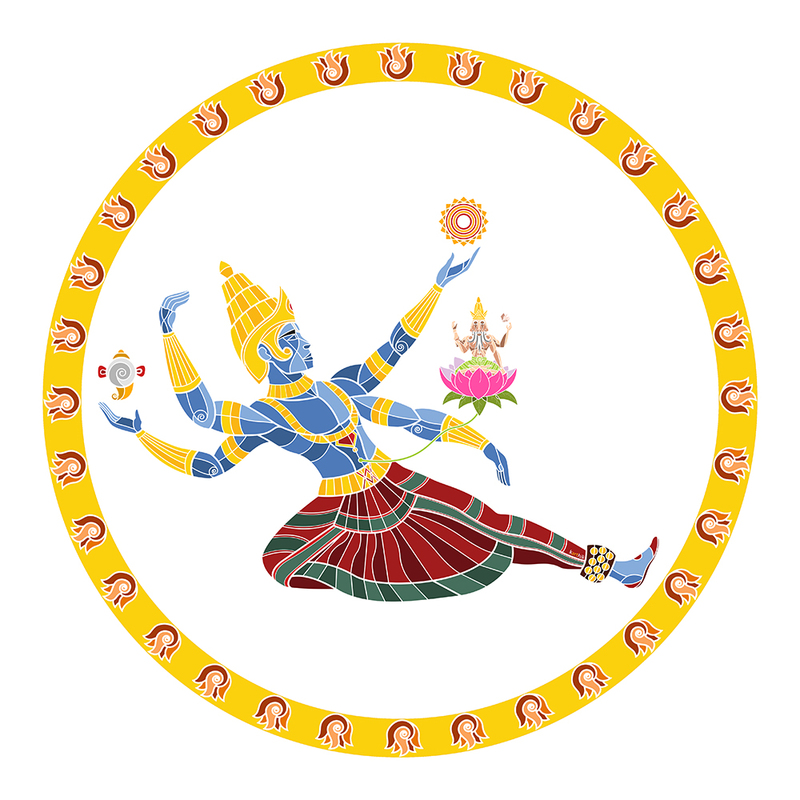 Shiva in the form of Nataraja is the patron of Bharatanatyam in India. It was only logical that I extend participation in the dance to his wife Parvati/Shakti. I put Shiva in an advanced Bharatanatyam pose I saw and Parvati in her traditional Kamakshi/Meenakshi pose with a symbolic parrot in her hand. In addition, Parvati is generally depicted with green skin in this form, hence her unique look here. Stories tell us that Vishnu has a complexion of dark water-filled clouds and reclines atop a thousand headed snake in the Ocean of Milk. In his dream, a lotus grows out of his navel, out of which is born Brahma, who then creates the rest of the universe. (It’s very Inception like). His name comes from a root that means ‘Settling/Pervading’ which gives it the meaning of ‘All pervading or Omnipresent one’. His snake is called Aadhisesha or Ananthasesha, where Sesha means ‘Remainder’, ‘Aadhi’ means beginning and ‘Anantha’ is derived from the root which means ending, hence giving his name the meaning ‘That which exists even when all else ceases to exist’. I was very inspired by my previous Nataraja drawing to try and represent this in the form of a Bharatanatyam dancer showing the Ananthasayana, except in this case the dancer is a 4 armed Vishnu himself, with one hand representing the snake sheltering him, one hand showing that he is reclining and resting, another hand holding his conch-shell ‘Panchajanya’ which represents the vibration of the universe and the last hand holding his discus ‘Sudarshan Chakra’ which represents either time or divine insight. In usual depictions of this pose, he also holds a mace ‘Kaumodaki’ representing Justice, and a lotus ‘Padma’ representing the Universe. Since my main focus here was to bring out the Bharatanatyam aspect of the pose and I already had a lotus, I decided to skip them. Also missing in this pose are his consort: Lakshmi and his vehicle: Garuda, both of whom I skipped because I wasn’t sure how to depict them in Bharatanatyam forms (I consider both as characters and not accessories). Perhaps next time? Something that struck me from a Project Management perspective when I saw this was that while Brahma is creating the Universe, he originates from Vishnu’s dream. Similarly, while it is a Product Manager who provides requirements to the Developers, he has to constantly take inputs from the dream or vision of the Business Stakeholders for his requirements and has to be monitored closely. The story of Ganga’s descent from the heavens says that Ganga came in answer to Bhagirata’s prayers in order to cleanse his ancestors of their sins and ensure that they all go to heaven. But it was also deemed that she was too fierce and powerful to descend directly upon the earth. And so Shiva volunteers to take the full force of her descent into his matted hair where she spirals through his labyrinthian locks and is released as a steady and more manageable stream. Apsaras are often associated with River Spirits as is the nature of rivers to descend from the sky in the form of rain, reside for a short duration on earth in the form of lakes or rivers and in the end rejoin the ocean or return to the skies. On a work side, this sort of reminds me of a Scrum Master/Product Manager taking up the responsibility of the entire set of product/delivery requirements, is able to make sense of what’s important/urgent and what’s not and breaks them down into smaller and more manageable pieces of work for the Scrum Team to process. On the design side, I decided to skew the proportions a bit and make a really huge Ganga descend upon a much smaller Shiva to try and convey the magnitude of the problem he was trying to control. And since these two are the core focus of the piece, I left the background black to avoid any unwanted distractions.